It’s that time of year again… prom season! Okay, yeah, probably not at all what you were thinking, but it’s true. I’ve been out of high school for so long now (almost ten years; my reunion is next year. Yikes that makes me feel old!) that I sometimes forget how important of a time it is for a lot of young women. Finding the perfect dress, getting your hair and nails done, getting ready with your friends, eating a fancy meal, and then spending all night long with your friends and maybe a special someone, it’s a high school rite of passage. It’s one of the first opportunities to do something special with a significant other, or even just a group of your friends, and be independent enough to make your own (hopefully safe) decisions. For me, prom ended up being a nightmare. My hair appointment took almost three hours instead of the maximum of two that I allotted. By the time I got home and was doing my makeup, my hair had already almost completely fallen and lost its luster. I remember frantically trying to get my makeup done as quickly as possible, but it was no use. I was still way behind, and It meant missing pictures with my group. Then, I found out my date couldn’t get off work early so I was left dateless for the entire dinner and had to wait for him to arrive at the venue so we could go in. Luckily my girl friends were inclusive and made it a fun experience regardless of things not going as planned. I learned a lot of important lessons that night, even if I didn’t realize it at the time. It doesn’t matter what dress you wore, how your makeup looked, or what you ate for dinner. What was important was the memories made with friends and the way you made others feel that night. Prom is about feeling special, and making others feel that way too. Now that we’re hitting the formals season, I’ve noticed an eerily familiar trend this year. The crochet lace and pastel colors that were so popular the year of my prom have reemerged. While things may be a little more refined and edgy this time around, trends do have a funny way of repeating themselves. When I saw this black crochet lace dress from Boohoo, I loved how it mixed the crochet lace I wore in my own gown to prom with the modern off the shoulder trend. This particular dress also had several underlayers to give the skirt a fuller look, however, to make it more versatile and appropriate for my lifestyle, I opted to remove this. 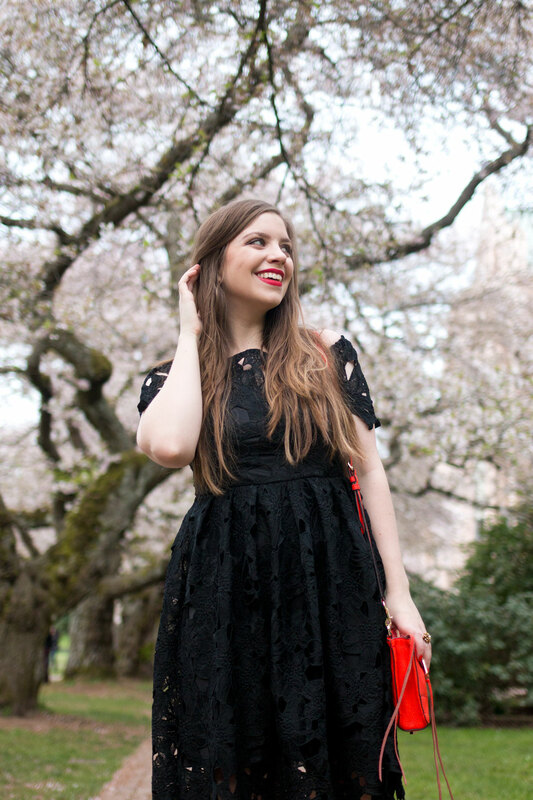 It reminded me that I really could re-wear my old Betsey Johnson prom dress again with just a few tweaks, and thought I’d share some of those ideas with you too. For formal styles, a lot of layers add drama and interest to an otherwise simple dress. But for wearing in a more casual environment, so much fabric and drama may not be appropriate. Consider removing any crinoline or tulle in the under layers of your dress for a simpler shape. Alternatively, if fullness is your style, consider amping up the drama by adding a full skirt underneath. You can find these at places like ModCloth. Did you go for the full-length gown but don’t have a lot of black tie events in your future? Consider having a trusted tailor hem your gown to cocktail length. Cocktail dresses are appropriate for a variety of events and, for me anyway, are much more common dress code over black tie. If you invested in a classic dress shape like a sheath, fit-n-flare, or full skirt, finding a way to dress it down is key. My favorite way to accomplish this is to pair on trend accessories like a fringe bag, a pair of ankle boots, and a moto jacket with a classic style to take the focus off the formal dress and onto the outfit as a whole. I often find what screams prom the most is the amount of embellishments used on prom dresses. If it’s feasible without ruining the garment, consider removing some of the bead work, rhinestones, ruffles, or other details. Even simplifying the amount of embellishment to a dress can completely change the look and allow it to blend seamlessly into your modern wardrobe. If your heart isn’t set on you personally wearing the dress again, then consider donating it to a local organization that provides prom dresses to those who need it most and letting someone new style it for their special night. There are a variety of organizations that provide this, but check Donation Town, Green Bride Guide, or LoveToKnow’s listings for places to donate nationwide. If you’re shopping for a prom dress this season or have another formal event coming up, be sure to check out the great selection of prom and formal dresses at Boohoo. Today and tomorrow, April 7th and 8th, shop all dresses and save 40% with code ALL30! Find one you love but it’s just a little too formal? Try some of the tips above to make the dress totally your own. Have you ever re-worn your prom dress? How did you style it to make it fit your personal aesthetic? I’d love to hear about it in the comments below! So lovely! Pretty dress and such gorgeous pictures. I’ve had so many prom and homecoming dresses sitting in the corner of the room to donate for ages. Thank you for this reminder to finally go out and do it! Thanks Kay! I was surprised I could still fit into mine, haha! My 10 year anniversary is coming up as well…. UGH! When did I get so old! 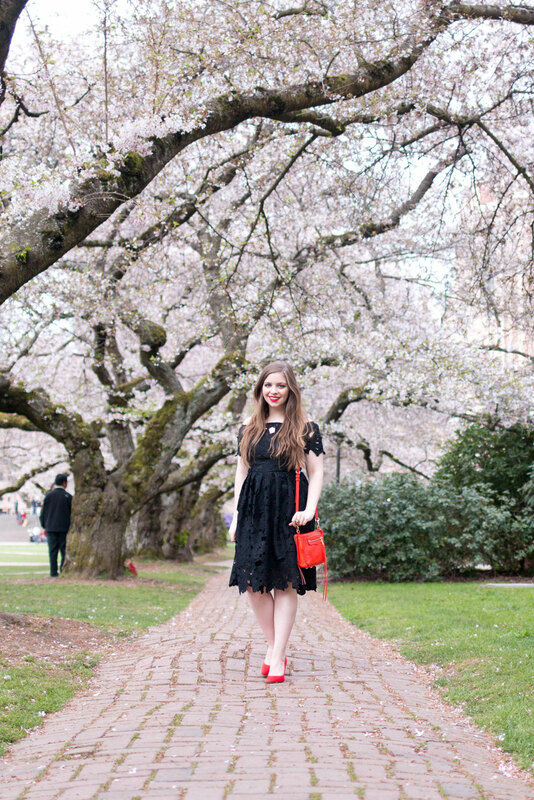 I loveee this dress you chose – I wish they had similar styles when I was in high school! While my prom dress is obviously long since outdated, I think these tips are great for bridesmaid dresses as well! Ah, I’m glad I’m not the only one who feels old, haha! ;) Totally agree, these could definitely apply to re-wearing bridesmaid dress! This post is real interesting. I have two prom dresses from previous years, and I was torn between selling them or making alterations. Thanks for the tips! These are awesome tips for re-using that expensive dress that we loved so much, but I also love that you opted for donating it for other uses!